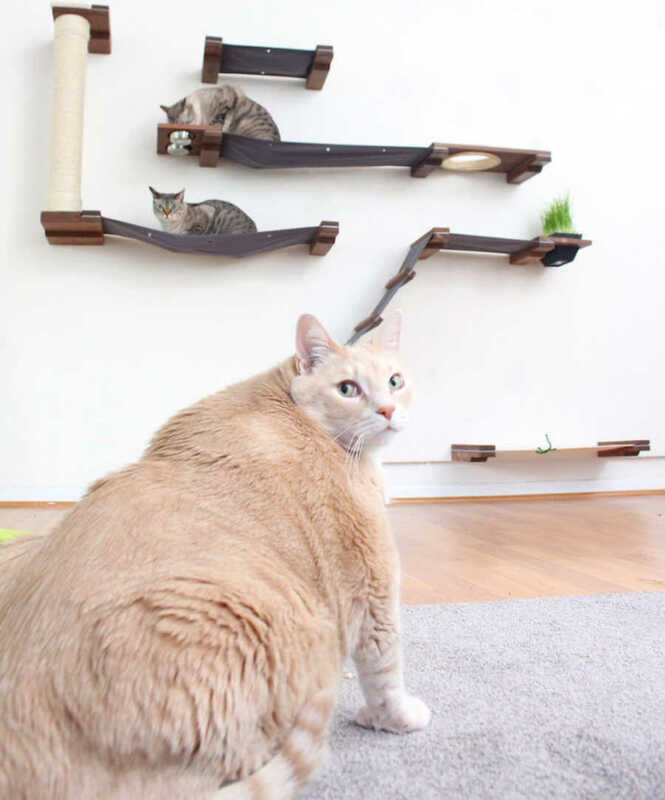 “Hi, my name is Mike Wilson and together with my girlfriend Megan Hanneman we have a company that makes wall-mounted cat furniture designed to promote activity for indoor cats. We have two cats who help us test our furniture ideas and let us know their favorite pieces. A couple of months ago, we decided to bring a new kitten into our home to join the two cats we had already. One day, when we only had 45 minutes before we had to be at work, we decided to head over to our local Humane Society to have a look around. When we walked in, we were instantly drawn to this gentle giant named Bronson. The receptionist told us that to go in and see him we would first need to sit down and be interviewed by a staff member. 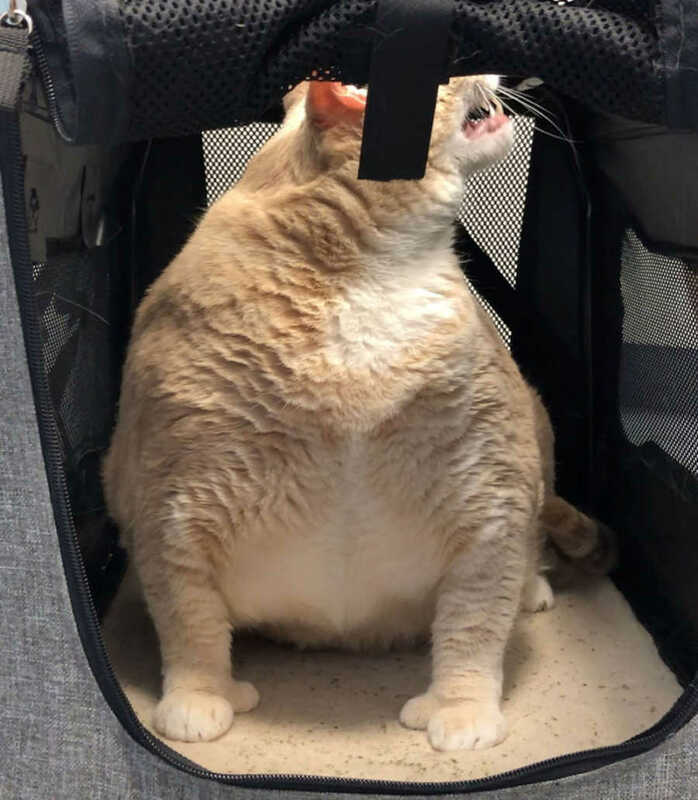 The Humane Society was backed up to the point that we weren’t able to see Bronson in person and so the first day all we saw of him was his backside. He made us wait for the front. We have started an Instagram account for him so that people could follow along on his weight loss journey. 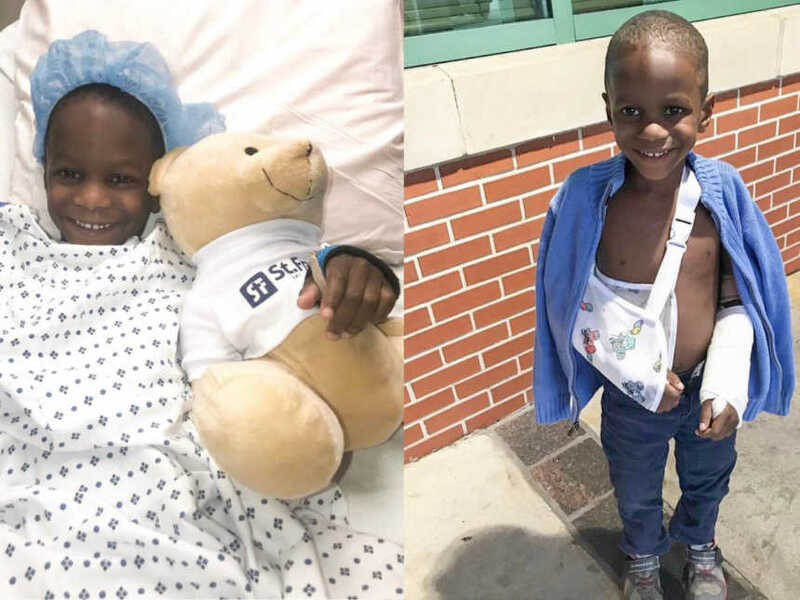 It’s been a little more than two months and he already has over 13,000 followers and a really nice community of people cheering him on along his way. 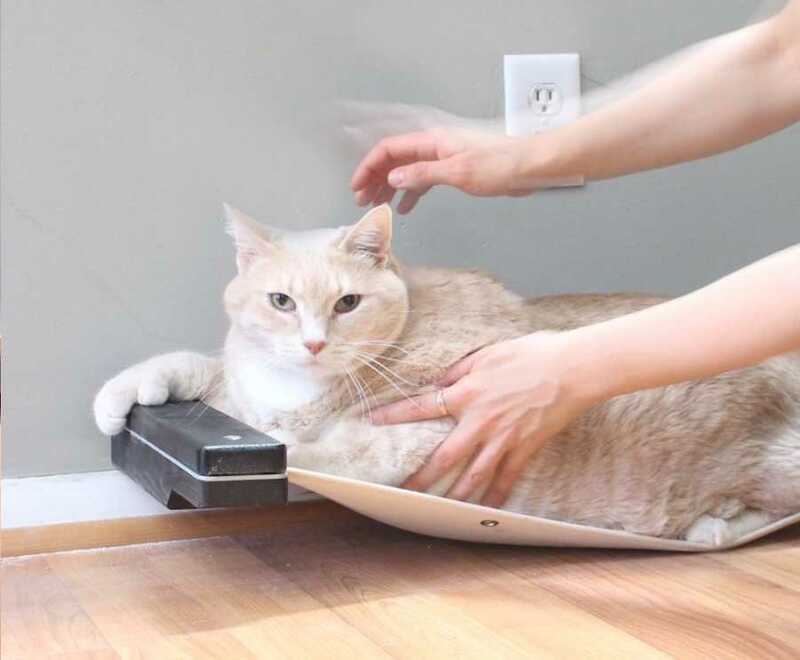 Many of his followers have been willing to share their tips on feline weight loss and it’s also a place where we can share their ideas. Carrying Bronson became an issue early on. 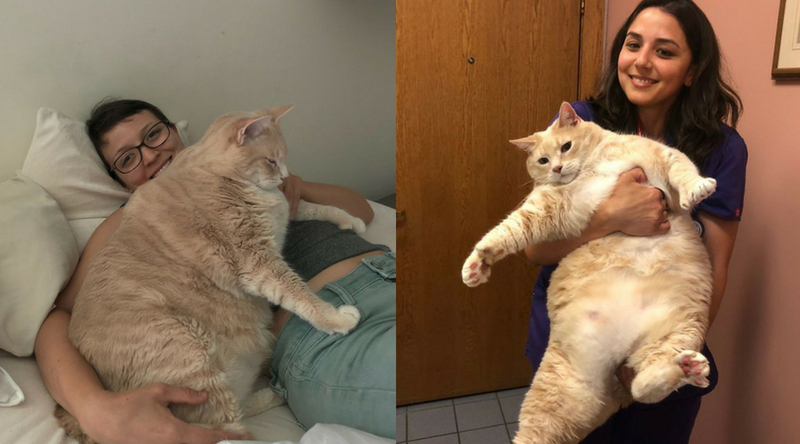 He’s so large and he carries a lot of weight in his chest, so there’s no great way to pick him up without feeling like we’re hurting or squishing him. To combat this problem, we invented the ‘transportation pillow, which is… just a pillow. 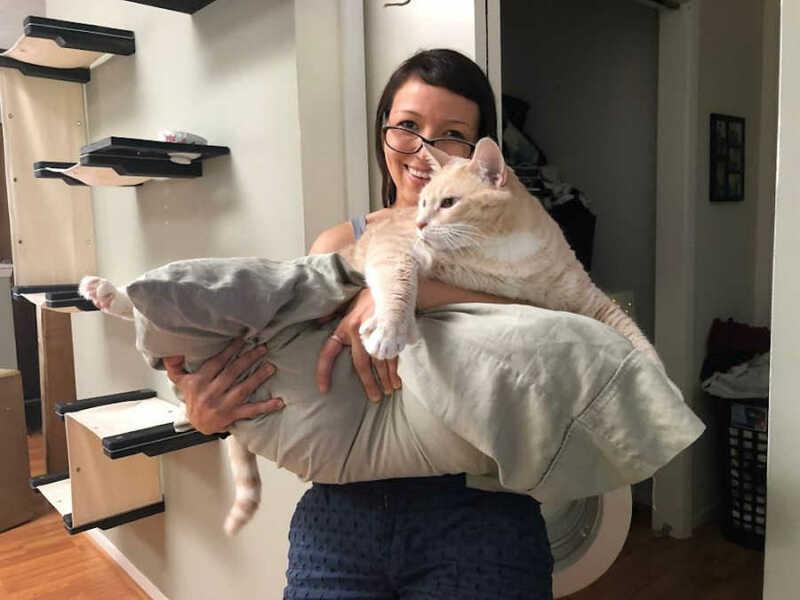 As simple of an idea as it is, carrying him with his pillow has been a great way to get him out to our living room without making him incredibly uncomfortable. One day, when we only had 45 minutes before work, and we decided to head over to our local Humane Society to have a look around. When we walked in, we were instantly drawn to this gentle giant named Bronson. After we left, neither of us could stop talking about him and how much fun it would be to bring him home and help him lose the extra pounds. 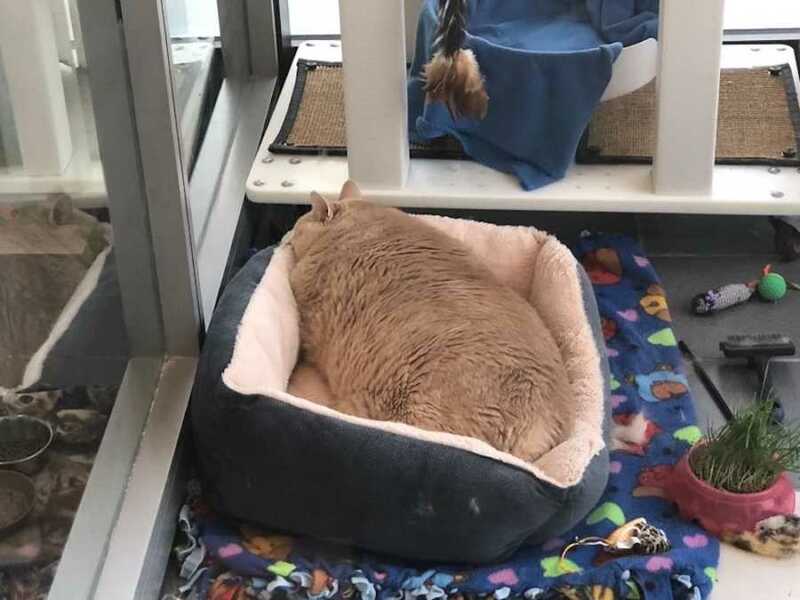 We went back to the Humane Society the next day, and a staff member told us that all they knew about cat’s past was that his last owner passed away. 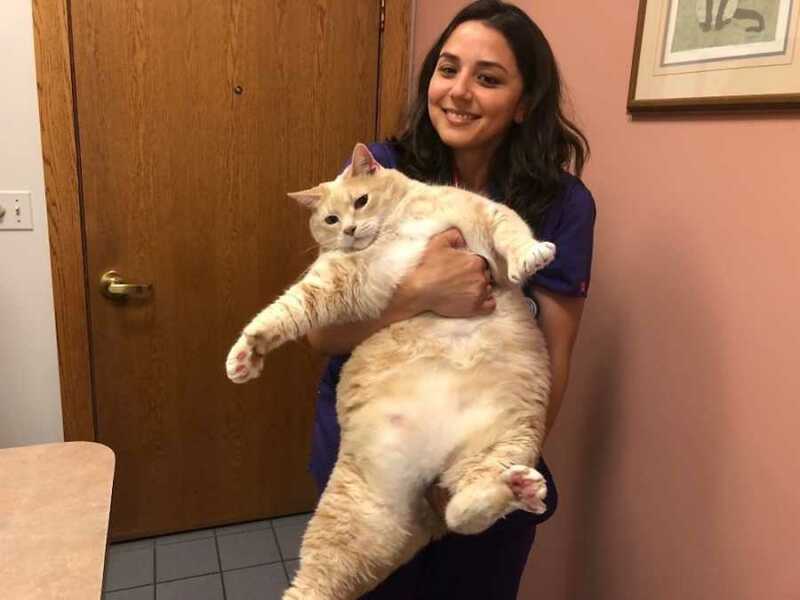 Since he was all the way up to 33 pounds and only 3 years old, they suspected it was an elderly person who may have been feeding him table scraps or something. 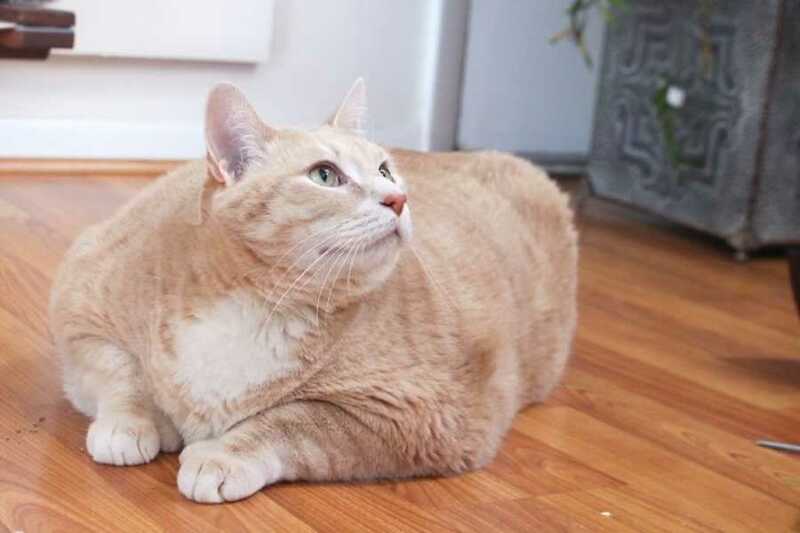 It’s very important for heavy cats to lose weight slowly, or else they can get Fatty Liver Disease, which can be a fatal illness. 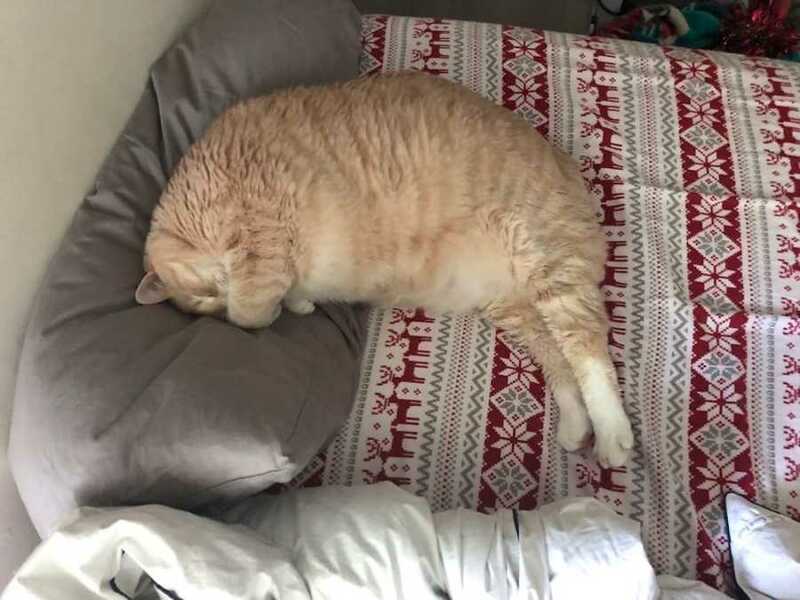 We have adjusted Bronson’s diet three times since we got him, but we think that he’s on track to safely lose this weight. 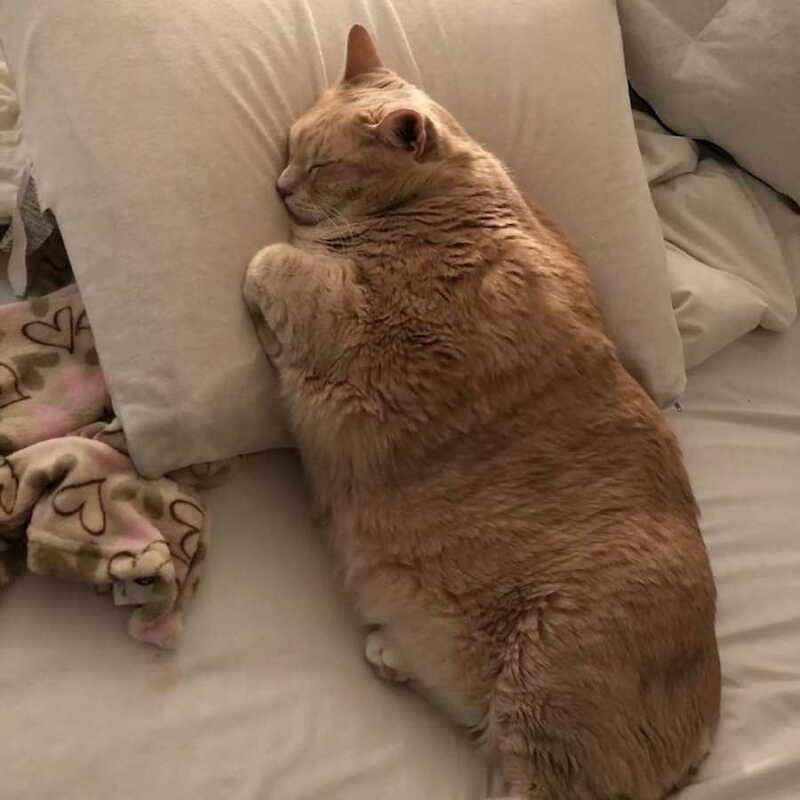 He’s currently on 375 calories per day. Half of them are from the kibble and half are from the grain-free wet food. We’ve also changed his exercise routine a few times. 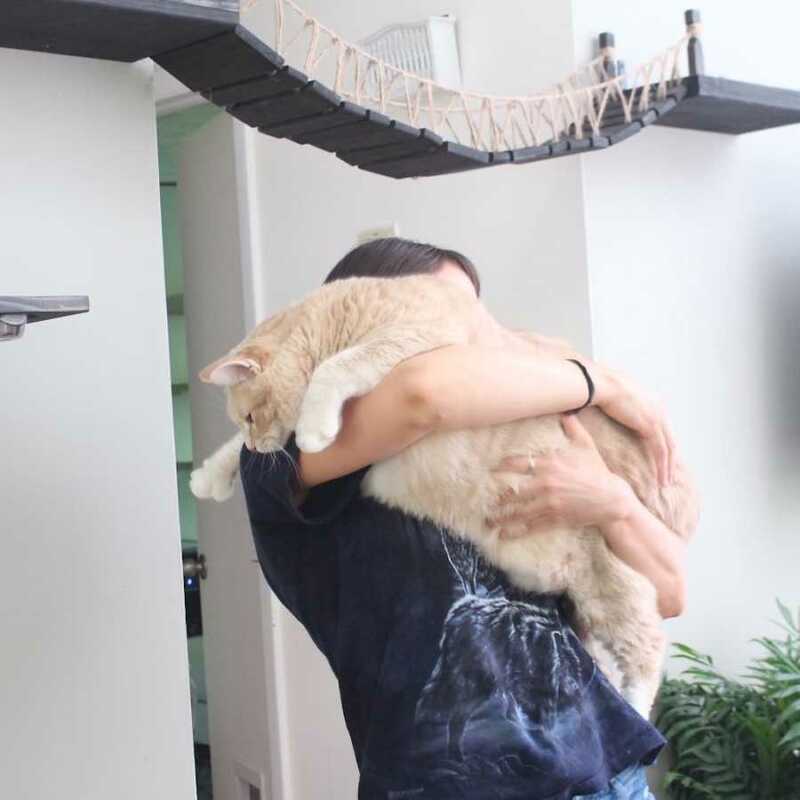 At first, it was playing with toys with him laying down for about 20 minutes a day and also carrying him downstairs so that he needed to climb back up to get to his favorite napping spot. He also isn’t shy about taking up too much bed real estate. We’ve pretty much split the bed into thirds. 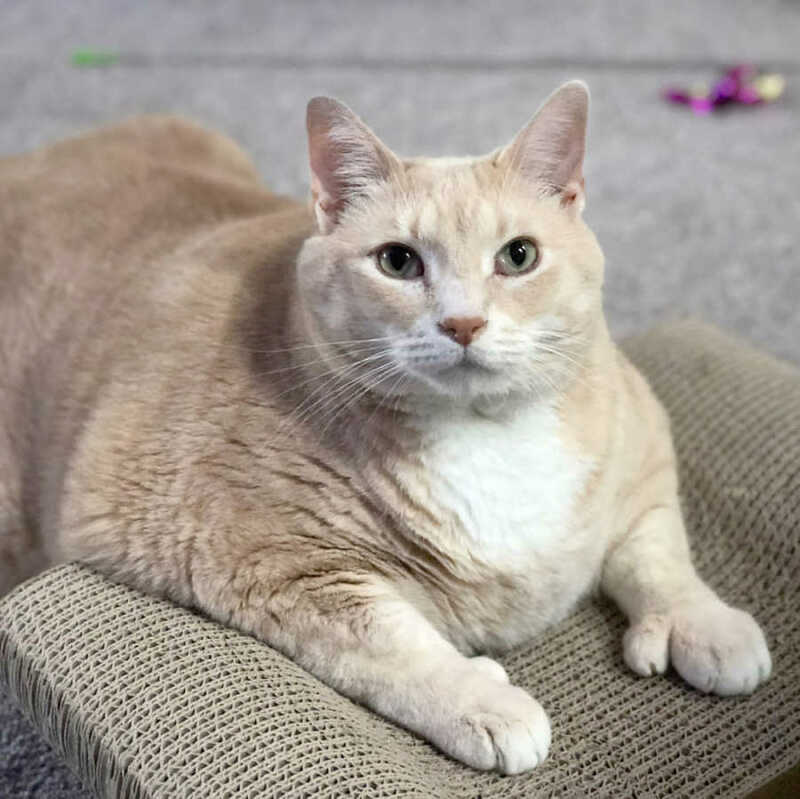 Our target goal is for Bronson to lose one pound per month and he’s currently down 1.6 pounds, so he’s well on his way to a healthy life. He’s not quite ready to join the other cats in testing the furniture up on the wall, but they know he’ll get there in due time! This story was submitted to Love What Matters by Mike Wilson. 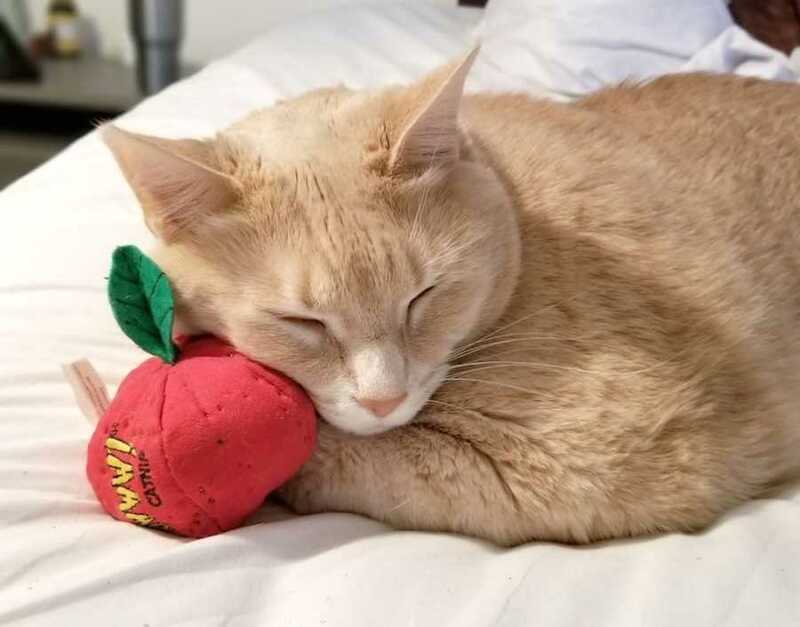 You can follow along with Bronson’s the Cat’s journey on Instagram here.